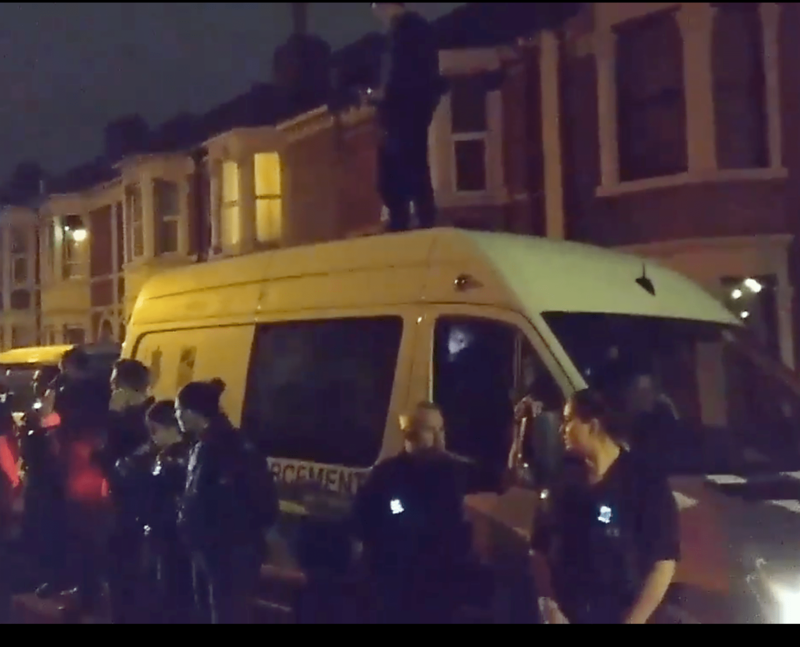 Around 100 people blocked a street in Bristol’s Easton neighbourhood trying to stop UK Border Agency deportation attempt last night. The stand-off, lasting through-out the night to the chants of “cops go home”, aimed at preventing the police from taking away and eventually deporting an Easton resident. The UK Border Agency van have been successfully blocked from leaving the area by protestors who came both on foot and in cars. The UK Border Agency officers arrived to the area after apparently receiving a tip-off that one man, a local resident, might be in the UK “illegally”. The news about the victims’ arrest quickly spread, and the local residents took a spontaneous direct action in hope to prevent him from being detained and deported. The border officers reacted with calling Bristol’s cops for assistance, however, this did not stop the impromptu protest and it carried on from about 10pm to 5am, when the “racist van” finally left the area. According to some reports, the man has been left by the police in a van without water, food or toilet for the duration of the action. His fate right now is unknown, but he is supported by a lawyer. Enough is Enough and the Cars of Hope collective just finished their work on a container in Velika Kladusa, Bosnia. The container will be used as a first aid station. In November they will start to build winterproof emergency shelters for the many people that sleep outside and in the improvised tents in the refugee camp in Kladusa. Neither the so-called big NGO’s, nor the state seem to be willing to do that until now and winter is coming fast. Of course daily needs like shoes, blankets and warm clothes are also being provided. #StopDeportations #Bristol #UK: Around 100 people block road in solidarity with deportation victim — Enough is Enough! | Anarchy by the Sea!